Origin & Soil: vineyards in the areas of Monforte, Serralunga and Castiglion Falletto. Origins go back to the Tortonian - Messinian era. Rich in calcareous clay and in magnesium and manganese elements. Taste: Garnet in colour and on the nose, wide and complex with hints of violet and forest fruit aromas. On the palate, full and velvety and well balanced. Due to its structure and characteristics, it is a perfect match for meat and game dishes, and tasty cheeses. Ideal serving temperature 17°C. Climate Vintage: The weather patterns this year were very favorable, and the end of August and beginning of September were very hot. We started the harvest on September 11th with the Dolcetto variety, which was already ripe. The forecast is a very well stractured, concentrated and intensely colored Dolcetto 2000. The particularly favorable climate (rich in humidity until June, followed by a hot summer in August and September), coupled with the thinning during the "green harvest" resulted in an optional concentration of the grape. Tasting the grapes we found escellent sugars, thick and healthy skins, deep colors and soft and intense tannins. Vinification: The selected grapes were destemmed and pressed. Maceration lasted 10 days at a maximum temperature of 30 °C. Malolactic fermentation was carried out before the end of winter. Ageing lasted 24 months in 100 Hl and 50 Hl Slavonian and French oak barrels and a small quantity in second time used Barriques. A further 12 months of bottle ageing followed in Prunotto's cellars before shipping. "Jeannie Cho Lee" has rated the wine "Prunotto Barolo DOCG, Piedmont, Italy" from the vintage 2008 on 26.11.2012 with 78 of 100 points.
" Light Nebbiolo with fruit that is dried out and disappointing - only 4 years old. Tasted in: Hong Kong, China. Maturity: Drink. " "Wine Spectator" has rated the wine "Prunotto Barolo DOCG, Piedmont, Italy" from the vintage 2012 on 15.12.2016 with 92 of 100 points. "Wine & Spirits Magazine" has rated the wine "Prunotto Barolo DOCG, Piedmont, Italy" from the vintage 2011 on 01.12.2016 with 88 of 100 points. "Wine Enthusiast" has rated the wine "Prunotto Barolo DOCG, Piedmont, Italy" from the vintage 2011 on 02.01.2016 with 89 of 100 points. "Vinous Antonio Galloni" has rated the wine "Prunotto Barolo DOCG, Piedmont, Italy" from the vintage 2011 on 01.12.2015 with 91 of 100 points. "Vinous Antonio Galloni" has rated the wine "Prunotto Barolo DOCG, Piedmont, Italy" from the vintage 2010 on 01.09.2014 with 90 of 100 points. "Huon Hooke" has rated the wine "Prunotto Barolo DOCG, Piedmont, Italy" from the vintage 2010 on 12.05.2014 with 90 of 100 points. "Wine Enthusiast" has rated the wine "Prunotto Barolo DOCG, Piedmont, Italy" from the vintage 2010 on 10.01.2014 with 91 of 100 points. "Wine & Spirits Magazine" has rated the wine "Prunotto Barolo DOCG, Piedmont, Italy" from the vintage 2009 on 01.12.2013 with 92 of 100 points. "Wine & Spirits Magazine" has rated the wine "Prunotto Barolo DOCG, Piedmont, Italy" from the vintage 2008 on 01.12.2013 with 88 of 100 points. "Vinous Antonio Galloni" has rated the wine "Prunotto Barolo DOCG, Piedmont, Italy" from the vintage 2009 on 01.10.2013 with 91 of 100 points. "Wine Spectator" has rated the wine "Prunotto Barolo DOCG, Piedmont, Italy" from the vintage 2008 on 30.06.2013 with 89 of 100 points. "Wine Enthusiast" has rated the wine "Prunotto Barolo DOCG, Piedmont, Italy" from the vintage 2009 on 09.01.2013 with 90 of 100 points. "Falstaff Magazin" has rated the wine "Prunotto Barolo DOCG, Piedmont, Italy" from the vintage 2008 on 22.11.2012 with 89 of 100 points. 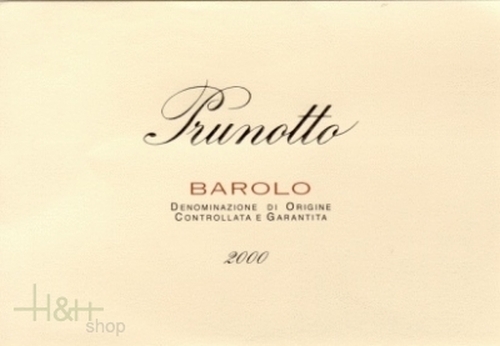 "Huon Hooke" has rated the wine "Prunotto Barolo DOCG, Piedmont, Italy" from the vintage 2008 on 16.05.2012 with 89 of 100 points. Excelent wine, the year is exeptional. Very well recomended!! Excelent wine, the year is exeptional. Very well recomended! ..